Representatives from 31 nations met in Bahrain on Tuesday to discuss the future of international anti-piracy operations in the Indian Ocean. 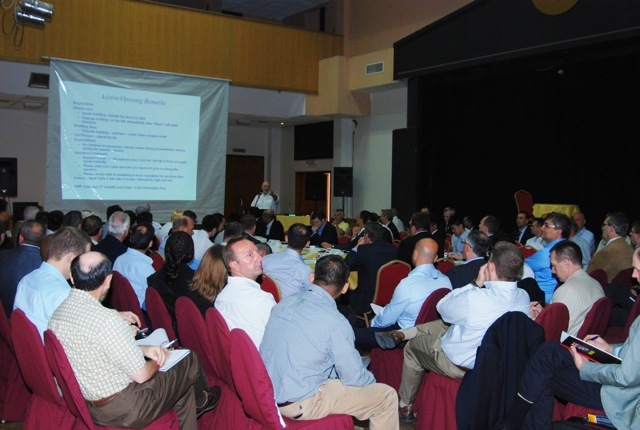 Military officers, government officials and trade representatives all attended the 27th Shared Awareness and Deconfliction (SHADE) conference, hosted by the Combined Maritime Forces (CMF). The quarterly conference was chaired by CMF in conjunction with NATO and the European Union Naval Forces (EUNAVFOR), and provides a forum for states, navies and industry members involved in counter-piracy operations in the region to share information and ideas. It also allows everyone taking part in the crackdown on piracy to coordinate their efforts, and ensure everybody is working towards shared goals. Subjects discussed at yesterday’s conference included the use of Best Maritime Practice by industry, armed security teams, and other methods in place to deter and defeat the threat of piracy in the region. The Conference also saw the active participation of the Chinese, Indian and Russian anti-piracy task groups, who, whilst not part of the CMF-NATO-EUNAVFOR partnership, gave presentations and agreed to share information with partnership forces and trade organizations.